A recurring series in which we take a look back at the city’s most familiar advertising icons. From the annals of spokesfigures whose time had come and gone before they’d even arrived, there’s Fatty Turkey, the eponymous mascot of Fatty Turkey Brand Whole Frozen Turkeys. A subsidiary spawned from McLaren Preservatives, the Fatty Turkey Brand was the brainchild of founder and then-president Leland McLaren, who’d decided to expand his modest nitrate and polysodium empire into the market which his goods typically serviced. Debuting in freezer sections in 1977 – during the height of the health-conscious mania gripping thirties-bound baby boomers – McLaren’s advertisedly bad-for-you birds may have seemed a counter-intuitive comestible. 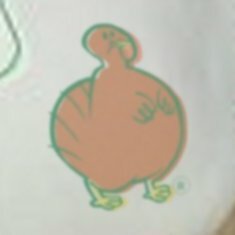 Essential to McLaren’s campaign to reclaim the luxurious implication of the long-since demonized word, pot-bellied Fatty Turkey himself was stamped onto the trademark Fatty Turkey “Rich White” packaging. The smiling, rotund bird sported a very unfashionable full-figure, which nonetheless seemed to ring a chord with typically calorie-conscious consumers. In time, Fatty Turkey was joined by Fatty Goose, Fatty Duck and Fatty (Cornish) Game Hen, both in the freezer section and in the company’s promotional coloring books, tee-shirts and cardboard cut-out finger puppets. Collectors of mascot memorabilia may be interested to know that the entire Fatty Family of plump poultry once adorned the cardboard cover of an Easter Egg dying kit, in 1984. Leland McLaren’s one-man mission to return respectability to “fatness” (what one Alternative Weekly newspaper reporter called “McLaren’s Crusade for the F-Word”) derailed in the late Eighties. During a live television broadcast of the annual Thanksgiving Day Parade from the Central Corridor and Downtown, McLaren – whose company had sponsored an in-parade appearance by health guru Richard Simmons and many of the super-sized dancers from his popular Sweatin’ To The Oldies series of videocassettes – interrupted himself during a television interview in order to indulge a seemingly unprompted tirade. “When I was young, gay meant happy! Now what does it mean? I’ll tell you – “ was as far as the rant was allowed to go by sound booth engineers. Apparently, one reclaimed word was enough, and McLaren stepped down owing to internal pressure from Nabisco, who’d purchased McLaren Preservatives two years earlier. The Fatty Turkey Brand was dissolved, and Fatty Turkey and his Fatty Friends have since waddled off to Fatty Obscurity. Yeh, those were the days. My dad worked in a grocery store and he’d bring home the inflatable “Fatty Turkey” that normally adorned the endcap display of fine McClaren products. It would act as centerpiece and placeholder for the actual Fatty Turkey once mom got done cooking it. Once it was replaced with the evening meal, we kids were free to play with the inflatable. It was far more fun than other mascot dispaly items dad would bring home, like Canny the Cranberry Sauce and Skinman, the Gravy skin. How would you like your dog?